Pieter Vancamp graduated as a biologist at the University of Leuven, and obtained his doctoral degree as a researcher at the research group of Comparative Endocrinology at the same university. He currently works as a post-doctoral researcher at the Natural History Museum in Paris, where he investigates the role of thyroid hormones in brain development. For centuries, people have been trying to understand the ‘how’ and ‘why’ of natural phenomena around him. One of the most intriguing domains is physiology, or the study of the biochemical mechanisms and functions of an organism. For instance, how does the human body maintain a core temperature of exactly 36.8 °C in freezing cold Belgium, as well as in the sweltering Spanish summers? As a researcher, I’m fascinated by neurobiology. The nervous system, and in particular the large and complex brain found in more evolved animals, are very intriguing. That grey mass is the result of millions of years of evolution, and has allowed us to question our very own existence and identity. In my research field, scientists investigate the interaction between thyroid hormones and the development of the brain. Thyroid hormones are ‘messenger’ molecules produced by our own body, and determine the well-being of every cell. One of their functions is to control the production of proteins, which makes these hormones essential for building the brain. In our lab, we are interested in a unique brain region that harbours stem cells, even in adults. In fact, these stem cells are able to produce new brain cells that can be useful to repair damaged brain tissue. This can be very important for an ever-increasing group of people suffering from neurodegenerative diseases, characterized by a progressive loss of brain tissue and consequently certain skills governed by the brain, such as movement. If we are able to elucidate how thyroid hormones regulate the development of that brain region, we could discover ways to trigger these stem cells to generate new cells in case of disease. In addition, recent alarming studies have shown correlations between exposure to certain industrial chemicals and disrupted hormone function, which in turn compromises brain development and function, which might have far-reaching consequences. However, the underlying cellular mechanisms remain unclear. Here too, we aim to elucidate the precise cellular interactions, so we can better estimate the potential consequences. Ultimately, we want not only to safeguard our health by informing and adjusting legislative policies, but also to drastically reduce the impact on our natural environment. However, despite the fast progress of medical imaging and various kinds of ingenious techniques, it remains very difficult to perform detailed research on the physiology of the brain. For that reason, scientists often rely on animal models. Although every animal species underwent a unique evolutionary process to respond properly to its environment, they all share a related biological background, inherited from a common ancestor. In other words, they share a common blueprint, which allows us to deduce the principles of human body processes based on findings in other animals. That is not surprising; every animal shares the same needs such as feeding, moving, and reproducing, elementary functions controlled by the anatomical brain. Nevertheless, there are limits to extrapolating results across species. Over the course of millions of years of evolution, the process of natural selection has led to the development of unique, adapted structures and functions in each species’ nervous system. How many laboratory animals do we need? In the lab, we perform our experiments on mouse brains, because the anatomy and physiology of these mammals resembles that of humans relatively well. On the one hand, we study the interaction of thyroid hormones and brain development in vivo, using experiments on live animals. When we put the mice on a specific diet that inhibits the production of thyroid hormones, we can assess how this affects the development of the stem cell zone. We can do this via harmless tests, such as an ‘odour’ test. In this test, repeated exposure to the same odour results in habituation, leading mice to invest less time in odour exploration. What happens is that the odour is saved in our memory, a process in which the stem cell zone plays a crucial role. When a new odour is presented, attention increases again and thus more time is invested in exploring. When things go wrong due to a lack of thyroid hormones, we can easily measures the consequences for this ‘short-term’ memory in function of invested time. The mouse does not experience any discomfort or pain throughout the whole procedure. However, we also need anatomical studies to explain these observations. This means we need to examine brains microscopically as well, for instance by visualising specific cell types. It enables us to determine when and where, as well as how exactly things go wrong, and how environmental changes can cause structural and consequently long-lasting problems. Dissecting the brains of animals and characterising changes at the cellular level is the only way to deliver irrefutable evidence to explain why something is what it is. Unfortunately, we cannot do this without euthanizing mice to dissect their brains for detailed studies. We also need to perform our experiments on multiple animals because of biological variation across individual animals. Strictly speaking, at our research institute, this adds up to tens of animals per study. We want to generate statistically reliable data, from which clear conclusions can be drawn. They form the basis for future studies, and for instance serve as the foundation for medical progress and legislative policy. Microscopic image of cells in culture, obtained from the stem cell zone within the brains of mice. The blue signal shows all cell nuclei, the green signal belongs to stem cells that have differentiated into nerve cells with typical extensions. You can also see some red cells; these are stem cells that turned into oligodendrocytes, a special cell type that has supporting functions in the brain. 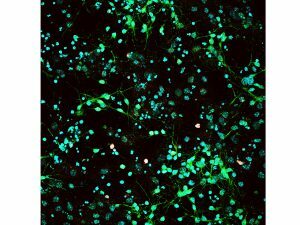 By treating these cells with various solutions, such as industrial-based chemicals, and consequently counting the green and red cells, we can determine what happens in the brain. However, that does not imply we can do anything we please to. Scientific research is bounded by strict European and national legislation intended to maximise animal welfare and comfort, and to minimise pain, or avoid it whenever possible. An animal facility needs to meet strict standards that are audited by experts on a regular basis. In addition, the set-up of every proposed study is evaluated by a college of experts, from a variety of different backgrounds. The number of animals, the severity of discomfort and/or pain, the duration of an experiment, possible alternatives… are all addressed and critically discussed. Every person involved in animal experiments will need to have followed proper education and training to be able to execute the required manipulations in the correct manner. The number of animals for each study needs to be motivated through statistical procedures, and novel techniques that can keep discomfort and/or pain as low as possible, systematically find their way in our domain. In other words, animal welfare has become a pillar in scientific research, and a compulsory matter within our training, an evolution that we as scientists can only support. That additionally means we are critically evaluating animal research, because even though steady progress has been made, there is still room for improvement. Constructive debate and assertive dialogue with each and everyone involved are the ultimate way to reach that goal. It is therefore worrying to see how certain videos are leaked online, showing animals being euthanized without any context, background or clarification. Some manipulations may look cruel or ruthless, while they are in fact the ethically recognised way to perform an experiment as quickly and as smoothly as possible. Purposefully spreading a wrong image by omitting proper explanation or commentary impedes an open dialogue. While this kind of communication is certainly misplaced, scientists also need to do some introspection. We need to find the courage to come out of our comfortable lab cocoon, put an effort to participate in the public dialogue, and be way more transparent about why, and especially how science is being practised. Communicating about such controversial and sensitive topics can be a difficult balancing exercise, but that is precisely why it is so important. However, while body processes can be mimicked in these in vitro laboratory conditions to some extent, it remains crucial to map the complex interactions of hormones and the brain in the organism itself. A whole other range of body and environmental factors also play a role, and could therefore lead to a different outcome in reality. Hence, it is incorrect to assume that every question in science and medicine will ever be answered without the aid of laboratory animals: that in vitro myth is and remains a myth. We do have to strive to use a minimal number of laboratory animals to obtain optimal results, minimise discomfort and pain as much as we can, and obtain as much relevant data as possible, via a multidisciplinary approach. Another trend is to use alternative laboratory animals, such as zebrafish, fruit flies, and octopuses. We have learned from many years of research (paradoxically with the help of laboratory animals) that brain anatomy and physiology across a big part of the animal kingdom is similar in many perspectives, and not only within the group of vertebrate animals. For example, fruit flies display similar behaviour when they are exposed to toxins, which are harmful for humans too, such as alcohol and drugs. The public opinion cares less for these animals, since their not as cute as some mammals, and because people believe these species experience less ‘pain’ and ‘suffering’, or even none at all, because they have simpler nervous systems. Scientists still do not agree whether some of these invertebrate species can really feel pain or not. Special structures to detect pain as we find them in vertebrate animals appear to be missing. It is possible however, that an inappropriate stimulus does not cause pain as we experience it, but rather that these animals try to avoid the stimulus when it poses a threat or a danger. A well-known debate in this context is the question whether a lobster experiences pain when it is put into boiling water during the preparation of the traditional Christmas diner. Does the lobster sense the extreme high temperature as pain, or is its physical reaction related to resist an unfavourable environmental temperature? Despite these questions, and also due to the fast increase in their use in scientific experiments, some of these less traditional animals have nowadays been included in animal research legislation. In addition, we cannot just test every hypothesis in a random animal; no two species are the same. For example, the stem cell zone that we study is also present in the zebrafish brain, but appears to be much more active in this species, and is capable of regenerating tissue spontaneously in case of nerve damage. On one hand, that gives us the possibility to investigate why zebrafish do possess this characteristic while mammals don’t. On the other hand, the problem in mammals remains, urging us to investigate why, and to search strategies to induce regeneration in these species too. 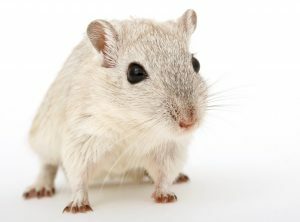 In the end, it is the combination of various laboratory animals and in vitro techniques that will lead to finding a solution. To end, I would shortly like to address a well-known argument of animal activists: ‘As scientists, we play God’. We take away the animals’ ‘freedom’ to choose between life and death, something that is in conflict with the fundamental rights of every living creature. While that argument holds true, it is crucial to emphasise the broader context. Firstly, some hypocrisy is rooted in this argument: Do you also pray for a divine miracle when you find yourself in a life-threatening situation? Or what is the origin of the piece meat that you buy at the butcher’s now and then? In addition, you can freely buy mousetraps and poison for a cheap price at your local store, giving your unwanted housemates a death sentence far worse than that of lab animals, with the bill as only administrative issue. However, the most important argument is that the scientific results that sprout from animal research are the basis on which the progress of human thinking evolves, and can or will be one of the most reliable ways to rescue nature and the whole ecosystem from the wave of extinction we are currently confronted with. By handling laboratory animals in an ethically correct and thought-out way, and by placing experiments in a broad societal framework nourished by an open dialogue, this is and will remain the most valuable and effective way to gradually get closer in understanding the beauty of nature and the living world around us.